Science, tone, and exploration. These are the values that drive Nanolog Audio and our ground breaking carbon technology that we infuse into our hand-made pedals from Canada. The heart of the company is our patented "Nanolog Devices" - carbon molecular junctions that use quantum mechanics to create distortion and overdrive in ways no possible with traditional silicon and germanium diodes. 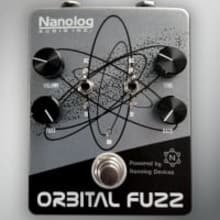 Founded by two senior PhD research officers from the National Institute for Nanotechnology located in Edmonton, Alberta, Canada, Nanolog Audio forges together a passion for science and music. In 2016, we collaborated with the legendary Dr. Scientist to create the first guitar effects pedal built with this new carbon technology - "The Heisenberg Molecular Overdrive". Now, we've established our own product lineup to include an array of distortion driven pedals, with our "Carbon Series" on sale November 13.